Allergic rhinitis , more commonly referred to as hay fever, is an inflammation of the nasal passages caused by allergic reaction to airborne substances. Allergic rhinitis (AR) is the most common allergic condition and one of the most common of all minor afflictions. AR affects up to 20 percent of children and 15 to 30 percent of adolescents in the United States. Antihistamines and other drugs used to treat allergic rhinitis make up a significant fraction of both prescription and over-the-counter drug sales each year. There are two types of allergic rhinitis: seasonal and perennial. Seasonal AR occurs in the spring, summer, and early fall, when airborne plant pollens are at their highest levels. In fact, the term hay fever is really a misnomer, since allergy to grass pollen is only one cause of symptoms for most children. Perennial AR occurs all year and is usually caused by airborne pollutants in the home and other places. A child can be affected by one or both types. Symptoms of seasonal AR are worst after being outdoors, while symptoms of perennial AR are worst after spending time indoors. Both types of allergies can develop at any age, although onset in childhood through early adulthood is most common. Although allergy to a particular substance is not inherited, increased allergic sensitivity may be genetic (inherited). While allergies can improve on their own over time, they can also become worse over time. AR affects up to 20 percent of children and 15 to 30 percent of adolescents. Boys are twice as likely to get allergic rhinitis as girls. Half of children develop the condition before age 10, and half after that time. Some regions of the country are more likely to have the pollens that cause AR, so those areas will have more children with the condition. Other risk factors include having a mother with asthma or having asthma oneself, having others in the family with AR, being the oldest in the family, having a family dog, being breast fed for more than a month and having a higher socioeconomic level. Allergic rhinitis is a type of immune reaction. Normally, the immune system responds to foreign microorganisms, or particles like pollen or dust, by producing specific proteins, called antibodies. Antibodies are capable of binding to identifying molecules (antigens) on the foreign particle. This reaction between antibody and antigen sets off a series of reactions designed to protect the body from infection. Sometimes this same series of reactions is triggered by harmless, everyday substances. This is the condition known as allergy, and the offending substance is called an allergen. Like all allergic reactions, AR involves a special set of cells in the immune system known as mast cells. Mast cells, found in the lining of the nasal passages and eyelids, display a special type of antibody called immunoglobulin type E (IgE) on their surfaces. Inside, mast cells store reactive chemicals in small packets called granules. When the antibodies encounter allergens, they trigger release of the granules, which spill out their chemicals onto neighboring cells, including blood vessels and nerve cells. One of these chemicals, histamine, binds to the surfaces of these other cells, through special proteins called histamine receptors. Interaction of histamine with receptors on blood vessels causes neighboring cells to become leaky, leading to the fluid collection, swelling, and increased redness characteristic of a runny nose and red, irritated eyes. Histamine also stimulates pain receptors, causing the itchy, scratchy nose, eyes, and throat common in allergic rhinitis. The number of possible airborne allergens is enormous. Seasonal AR is most commonly caused by grass and tree pollens, since their pollen is produced in large amounts and is dispersed by the wind. Showy flowers like roses or lilacs that attract insects produce a sticky pollen that is less likely to become airborne. Different plants release their pollen at different times of the year, so seasonal AR sufferers may be most affected in spring, summer, or fall, depending on which plants provoke a response. The amount of pollen in the air is reflected in the pollen count, often broadcast on the daily news during allergy season. Pollen counts tend to be lower after a good rain that washes the pollen out of the air and higher on warm, dry, windy days. House mite body parts. All houses contain large numbers of microscopic insects called house mites. These harmless insects feed on fibers, fur, and skin shed by the house's larger occupants. Their tiny body parts easily become airborne. Animal dander. Animals constantly shed fur, skin flakes, and dried saliva. Carried in the air, or transferred from pet to owner by direct contact, dander can cause allergy in many sensitive people. Mold spores. Molds live in damp spots throughout the house, including basements, bathrooms, air ducts, air conditioners, refrigerator drains, damp windowsills, mattresses, and stuffed furniture. Mildew and other molds release airborne spores that circulate throughout the house. Inflammation of the nose, or rhinitis, is the major symptom of AR. Inflammation causes itching , sneezing, runny nose, redness, and tenderness. Sinus swelling can constrict a child's eustachian tube that connects the inner ear to the throat, causing a congested feeling and "ear popping." The drip of mucus from the sinuses down the back of the throat, combined with increased sensitivity, can also lead to throat irritation and redness. AR usually also causes redness, itching, and watery eyes. Fatigue and headache are also common. AR that is not successfully treated by over-the-counter medication will benefit from an evaluation and treatment by a healthcare professional. Diagnosing seasonal AR is usually easy and can often be done without a medical specialist. When a child's symptoms appear in spring or summer and disappear with the onset of cold weather, seasonal AR is almost certainly the culprit. Other causes of rhinitis, including infection, can usually be ruled out by a physical examination and a nasal smear, in which a sample of mucus is taken on a swab for examination. Along with a runny nose and reddened eyes, other symptoms may include dark circles under the eyes caused by nasal congestion, the "alleric salute" in which a child rubs a hand along the side of the nose, mouth breathing, sleepiness during the day, and learning problems caused by inability to concentrate during school. Allergy tests including skin testing and provocation testing can help identify the precise culprit, but may not be done unless a single source is suspected and subsequent avoidance is possible. Skin testing involves placing a small amount of liquid containing a specific allergen on the skin and then either poking, scratching, or injecting it into the skin surface to observe whether redness and swelling occurs. Provocation testing involves challenging an individual with either a small amount of an inhalable or ingestible allergen to see if a response is elicited. Perennial AR can also usually be diagnosed by careful questioning about the timing of exposure and the onset of symptoms. Specific allergens can be identified through allergy skin testing. Avoidance of the allergens is the best treatment, but this is often not possible. When it is not possible to avoid one or more allergens, there are two major forms of medical treatment: drugs and immunotherapy. Always read the package label for directions or consult your doctor or pharmacist before treating children with over-the-counter medications. Children are not small adults, but have different physiology. They are more susceptible than adults to the effects of certain medicines and may have unexpected reactions. ANTIHISTAMINES Antihistamines block the histamine receptors on nasal tissue, decreasing the effect of histamine release by mast cells. They may be used after symptoms appear, though they may be even more effective when used preventively, before symptoms appear. A wide variety of antihistamines are available. Diphenhydramine (Benadryl and generics). May be used for children age 2 and up, depending on the type of delivery (capsule, liquid). Chlorpheniramine (Chlor-trimeton and generics). May be used for children age 6 and up. Brompheniramine (Dimetane and generics). May be used for children age 2 and up. Clemastine (Tavist and generics). May be used for children age 12 and up. Loratidine (Claritin). May be used for children age 2 and up. Cetirizine (Zyrtec). May be used for children age 2 and up. Fexofenadine (Allegra). May be used for children age 6 and up. Azelastin HCl (Astelin). May be used for children age 5 and up. DECONGESTANTS Decongestants constrict blood vessels to counteract the effects of histamine. Nasal sprays are available that can be applied directly to the nasal lining and oral systemic preparations are available. Decongestants are stimulants and may cause increased heart rate and blood pressure, headaches, and agitation. Use of topical decongestants for longer than several days can cause loss of effectiveness and rebound congestion, in which nasal passages become more severely swollen than before treatment. TOPICAL CORTICOSTEROIDS Topical corticosteroids reduce mucous membrane inflammation and are available by prescription. Allergies tend to become worse as the season progresses because the immune system becomes sensitized to particular antigens and can produce a faster, stronger response. Topical corticosteroids are especially effective at reducing this seasonal sensitization because they work more slowly and last longer than most other medication types. As a result, they are best started before allergy season begins. Side effects are usually mild, but may include headaches, nosebleeds, and unpleasant taste sensations. However, a larger skin surface area to body weight ratio may make children more susceptible to adrenal gland problems such as growth retardation and delayed weight gain. Topical corticosteroids administration to children should be limited to the least amount possible to achieve therapeutic effect. MAST CELL STABILIZERS Cromolyn sodium prevents the release of mast cell granules, thereby preventing release of histamine and the other chemicals contained in them. It acts as a preventive treatment if it is begun several weeks before the onset of the allergy season. It can be used for perennial AR as well. Cromolyn sodium is so low in side effects that it is recommended for children as young as two years of age. Immunotherapy, also known as desensitization or allergy shots , alters the balance of antibody types in the body, thereby reducing the ability of IgE to cause allergic reactions. Immunotherapy is preceded by allergy testing to determine the precise allergens responsible. Injections involve very small but gradually increasing amounts of allergen, over several weeks or months, with periodic boosters. Full benefits may take up to several years to achieve and are not seen at all in about one in five patients. Individuals receiving all shots will be monitored closely following each shot because of the small risk of anaphylaxis , a condition that can result in difficulty breathing and a sharp drop in blood pressure. Allergy shots can be given to children as young as five years. Alternative treatments for AR often focus on modulation of the body's immune response, and frequently center around diet and lifestyle adjustments. Chinese herbal medicine can help rebalance a person's system, as can both acute and constitutional homeopathic treatment. Vitamin C in substantial amounts can help stabilize the mucous membrane response. For symptom relief, western herbal remedies including eyebright ( Euphrasia officinalis ) and nettle ( Urtica dioica ) may be helpful. Bee pollen may also be effective in alleviating or eliminating AR symptoms. 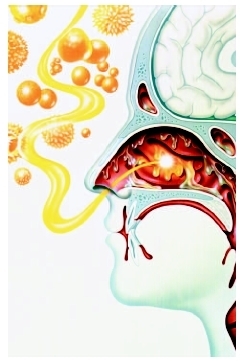 Illustration depicting excessive mucus production in the nose after inhalation of airborne pollen. Most children with AR can achieve adequate relief with a combination of preventive strategies and treatment. While allergies may improve over time, they may also get worse or expand to include new allergens. Early treatment can help prevent an increased sensitization to other allergens. Moving to a region with lower pollen levels is rarely effective, since new allergies often develop in children. Preventing perennial AR requires identification of the responsible allergens. AR can lead to daytime sleepiness in school and affect school performance. Allergen —A foreign substance that provokes an immune reaction or allergic response in some sensitive people but not in most others. Granules —Small packets of reactive chemicals stored within cells. Histamine —A substance released by immune system cells in response to the presence of an allergen. It stimulates widening of blood vessels and increased porousness of blood vessel walls so that fluid and protein leak out from the blood into the surrounding tissue, causing localised inflammation of the tissue. Mast cells —A type of immune system cell that is found in the lining of the nasal passages and eyelids. It displays a type of antibody called immunoglobulin type E (IgE) on its cell surface and participates in the allergic response by releasing histamine from intracellular granules. Allergic and Non-Allergic Rhinitis: Clinical Aspects. Editted by N. Mygund and R. M. Naclerio. Philadelphia: W. B. Saunders Co.,1993. Lawlor, G. J. Jr., T. J. Fischer, and D. C. Adelman. Manual of Allergy and Immunology. Boston: Little, Brown and Co., 1995. Novick, N. L. You Can Do Something About Your Allergies. New York: Macmillan, 1994. Weil, A. Natural Health, Natural Medicine: A Comprehensive Manual for Wellness and Self-Care. New York: Houghton Mifflin,1995. "Allergic Rhinitis." The Children's Hospital of Philadelphia. September 2003. [cited August 13, 2003]. http://www.chop.edu/consumer/jsp/division/generic.jsp?id=76995. "Allergic Rhinitis in Children." Medical College of Wisconsin. 2001. [cited August 13, 2003]. http://healthlink.mcw.edu/article/992530573.html .